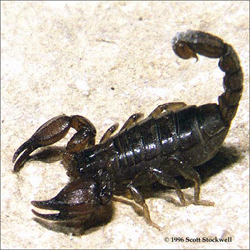 The purpose of this page is to provide a little non-technical information about individual species of scorpions. It is intended for reading by persons who are casually interested in scorpions, but who don't need to be overwhelmed by technical jargon. This is a list of the species featured in past Scorpion du jour segments. Enjoy!